Contemporary cantata inspired by words of the world's great peacemakers and visionaries; premiered by the Portland Gay Men's Chorus in 2007. 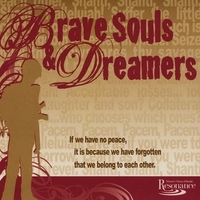 BraveSouls and Dreamers is a powerful, deeply moving, cathartic anti-war statement, told through the emotional journeys of two soldiers, and a Mother. A Sage voices words from some of the world's great peacemakers, and the chorus acts as witness to their journeys. Composer Robert Seeley's music is tonal, accessible, melodic, and beautifully crafted. The composer/librettist team of Robert Seeley and Robert Espindola have written numerous works together, many of them commissioned by choruses within the gay and lesbian choral movement. This work was commissioned by the Portland Gay Men's Chorus in 2007, in response to the beginning of the war in Iraq. Resonance premiered the women's chorus version in 2009.